"A fresh Eastern style rice salad with lots of vegetables!" In a saucepan bring 1 1/2 cups salted water to a boil. Add 3/4 cup rice, reduce heat, cover and simmer for 20 minutes. Refrigerate rice until chilled. 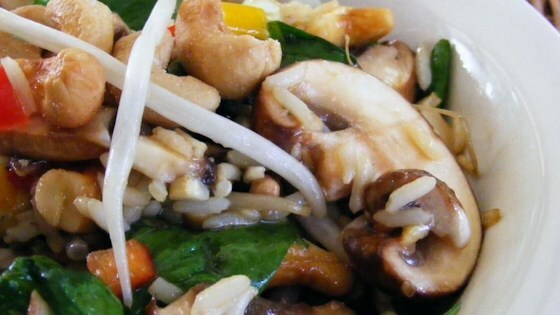 Combine the chilled cooked rice, mushrooms, green peppers, red peppers, cashews, green onions, bean sprouts, spinach and celery in a large bowl. Blend the vegetable oil, soy sauce, parsley and crushed garlic in a separate bowl. Pour the dressing over the salad 1 hour before serving and toss well. This is sooo good! It always gets rave reviews. I like to add the dressing just before serving, because it does tend to get soggy. Simple and delicious. I used white and wild rice instead of just white. A new classic! This recipe has been a hit at both a groom's rehearsal dinner and at a pot luck. I always get asked for the recipe. Absolutely delicious! I served it with grilled tuna steaks and sourdough, it was a total hit. Everyone had additional helpings and kept commenting how yummy it was! I've made this salad for almost every BBQ we've attended this summer and am always asked for the recipe.